On my personal homepage I've collected some stuff. Have fun in visiting this! Please see all main items on the left hand navigation bar. If you have any questions or recommendations, please let me know! I'm always happy about receiving feedback. Did you also sometimes want to test exception cases and the right tools are missing? I recently wanted to test a locked file exception in Java but from implementing the test it seems there is no easy way in Windows to lock a file for testing (at least I'm not aware of, hints are welcome...) - so I was writing a small command line tool to help me implementing my test cases. Nun ist es passiert. Lange habe ich sie getragen, etwa zur Zeit meiner Konfirmation habe ich sie bekommen, aber nun - ca. 17 Jahre später sind sie nun wohl wirklich kaputt. Meine Birkenstocks. Da hatte ich sie sogar schon vor 10 Jahren mal auf die Loveparade mitgenommen, stand da etwas dumm herum in abgerissener Jeans mit Birkenstocks. Small command line tool to reduce the size of duplicate files on one partition. Despite all other known tools the files in this implementation are not being listed, archived or removed but going to be hard linked using NTFS hard links. 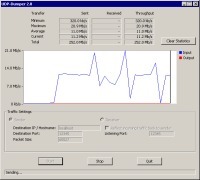 The tool runs in Windows NT 4.0 / 2000 / XP and 2003 Server and requires a NTFS file system to run on. Small Java Wrapper around any Java object to gather XML DOM Level 1 trees. Target of this implementation is to retrieve DOM XML from any Java object without use of any mapping file. The result can be used to process any bean or to serialize it. All access to objects is done using reflection. In this way all public members of the class are available. Besides other projects (e.g. Jakarta Betwixt) this code does not use mapping files but as trade-off is may not be too performant. A port of the famous arcade game "Snake" for Palm Pilot as known also from most mobile phones. Created together with Michael Ludwig and the GCC compiler collection. Kleines Programm, das so viele UDP-Pakete wie möglich an einen Zielrechner sendet. Dabei wird die Netzwerkkapazizät bis zum Äußersten ausgelastet. Das erste und letzte Programm, das ich in Delphi geschrieben habe. 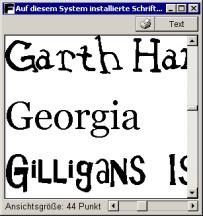 Es listet alle im System installierten Schriftarten.